Directions: Write the episode mission below in the "Episode Mission" box of your Episode 2 Lesson Chronicles. I can tell you the part that John D. Rockefeller played in building America. Directions: Read the Episode 2 Overview below. Vanderbilt expands his enterprises, realizing that oil is the nation’s next crucial commodity. The demand for oil is high and Vanderbilt knows that it will be an important item for his trains to transport. He turns to a young oilman from California named John D. Rockefeller to make a deal that will work for both businessmen, but rivalries emerge between them. Rockefeller’s Standard Oil has become one of the nation’s first monopolies. A financial panic in 1873 shows that the American economy is on shaky ground even as it expands. Directions: Write the vocabulary words and terms below in the "Vocabulary and Terms" box of your Episode 2 Lesson Chronicles. Directions: While Watching Episode 2: Oil Strike, answer each of the following questions in the "Episode Guide" section of your Episode 2 Lesson Chronicles. You should read one question ahead so that you are always listening for the answers you need. If you are absent, you can view the Episode by clicking on the link below. What problem did John D. Rockefeller face in his deal with Cornelius Vanderbilt? _________________________________________________________________. Rockefeller realizes ________________________ has the potential to change the world, and can make him rich in the process. Rockefeller didn't want to take the risk involved in finding oil wells. He realized that the real money was in __________________________. Rockefeller gained control of almost every refinery in the country. We call this idea a/an __________________________________. After Rockefeller gained an oil monopoly, ____________________ thought he was getting too powerful, so he joined with his competitor ___________________ and pulled all of Rockefeller’s deals with them. Rockefeller knew that if he could build a _____________________ large enough, he would be able to cut the railroads out of the oil business for good. Rockefeller’s pipeline caused the railroads’ stock to crash and the _____________________________. When most Americans were struggling, Rockefeller was doing very well, even buying up struggling companies. Rockefeller felt this was because of an idea or theory called _____________________________________________. John Rockefeller ended up owning _______________ percent of the U.S. oil market. Rockefeller’s great-grandson gives him credit for being a great businessman but not for _____________________________________. Directions: After Watching Episode 2: Oil Strike, click on the links below and blog your answer to each of the following discussion questions. Make sure you write in complete sentences and that what you type makes sense. After everyone has blogged, we will discuss your answers and together create, "the great answer" by compiling and revising all of the best responses. After we create, "the great answers" as a class, you will write these in the "Class Discussion" section of your Episode 2 Lesson Chronicles. Directions: Look at the political cartoon below by Joseph Keppler published in Puck Magazine. The political cartoon is called "Next." Answer the questions below about the political cartoon in the Episode 2 Investigation Box of your Episode 2 Chronicles. 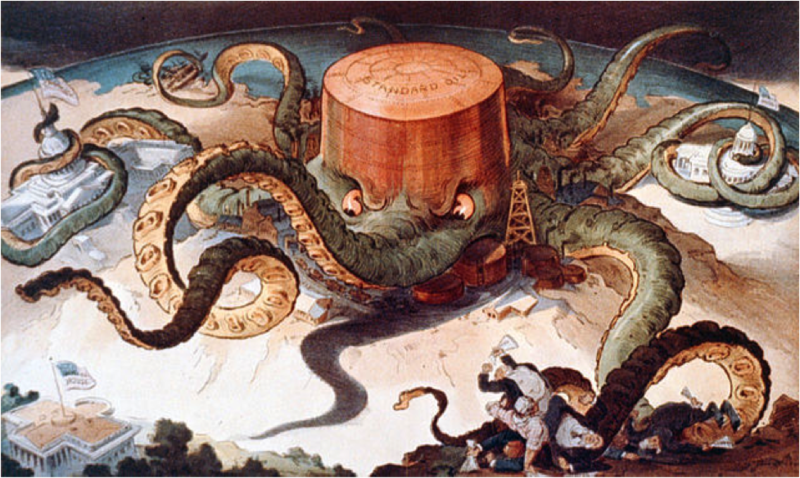 This political cartoon is of a "Standard Oil Tanker" shaped as an octopus. It is meant to symbolize the control that monopolies had over the economy and the government. This cartoon was published in 1904 during Teddy Roosevelt's presidency. The octopus is controlling the Congress (upper left building), the state capital buildings (upper right building), the shipping (upper left), the railroads (under center tentacle) and other business owner or politicians (lower right corner). The only thing not under control of the octopus is the White House. President Roosevelt is using the Sherman Anti-trust Act to regulate the monopolies. Describe what is happening in this cartoon. What does the octopus represent? What message does this cartoon convey about Standard Oil’s power and influence? What does this cartoon suggest about the relationship between Standard Oil and the U.S. government? Explain. Why did the cartoonist title the work “Next!”? What effect do you think the cartoonist intended his work to have on his audience in 1904? 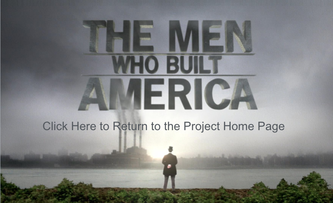 Directions: You have completed the Episode 2 Lesson of the Men Who Built America Project. Click on the icon below to go back to the Project Homepage.